It started with an altercation at the bar in Quezon City last May between award-winning actor Baron Geisler and indie actor Kiko Matos. Now, it ended up in a mixed martial arts fight also at a bar. 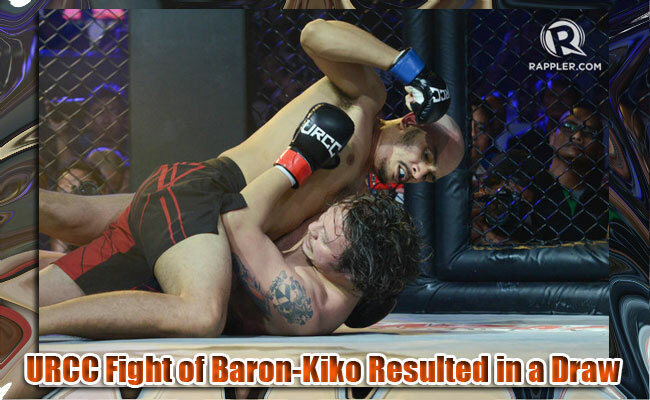 Alvin Aguilar, a URCC Founder offered the actors to settle their feud through a MMA fight. The much anticipated fight between the 2 actors brought excitement to the fans and onlookers but some were disappointed as it was not as brutal as what they expected but the 2 gave each other some damages. The 2-round Universal Reality Combat Championship (URCC) fight happened last June 25 at the Valkyrie bar in Bonifacio Global City. At the 1st round of the fight, Matos successfully mounted Geisler and dominated the round but at the 2nd round, Geisler was able to recover when he pinned Matos at the cage and it cause the latter to be exhausted. Before the announcement of the winner, the actors turned MMA fighters hugged each other causing the audiences to cheer for them. In the end, the 3 judges decided to have a draw with a score of 19-19. After their fight, Geisler and Matos were flocked by the media on what can they say about each other. Geisler revealed that he did his best at the 2nd round to survive from the attacked made by Matos at the 1st round. His team was also proud of him despite only having 5 training days. He also reiterates that his settlement with Matos was sincere as they now respect each other as actors and as humans. Matos also believed that Geisler was sincere to make peace with him and revealed that he told Baron that he loves him. Reporters also asked Matos if he really sprayed a pee during their weigh in but he revealed that it was just a beer and he did that stint just to annoy Geisler.